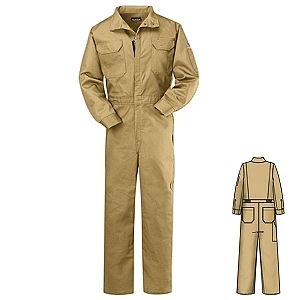 Two-way concealed NOMEX® taped brass breakaway zipper, concealed snap at top of zipper and at neck. Mandarin style, stand up, two-way safety collar. Concealed snap closure on cuff. Two front swing pockets, two patch chest pockets w/ flaps and concealed snap closure, two patch hip pockets, left sleeve pocket. Side vent opening w/concealed snap closure. This flame-resistant garment meets the requirements of NFPA 2112, Standard on Flame-Resistant Garments for Protection of Industrial Personnel Against Flash Fire, 2012 Edition; EN ISO 11612:2008, Protective clothing against heat and flame; EN 340:2003, Protective clothing – General requirements; IEC 61482-2:2009, Live working – Protective clothing against the thermal hazards of an electric arc; and EN 1149-5:2008, Protective clothing – Electrostatic properties, part 5: performance requirements.